Troops! Rally! Our beloved show is definitely in trouble. I really don’t understand the ratings game. As a 50-year-old woman I have a TON more buying power than a 25-year-old unemployed young man. While the industry is definitely trying to change from the old Nielsen model, it isn’t going fast enough to catch up to the quality shows we want to keep around. When ENLISTED was shown at upfronts in May of 2013, it got feedback from a critical audience. To the network’s credit, they didn’t just scrap the show after the pilot. They decided to regroup and fix it. The premiere originally moved to November was now moved to January. Some of the principal cast members attended boot camp at Fort Bliss. They made fun of themselves. They invited the audience at the premiere in January to spot their mistakes. They engaged the military audience and made each script better. They brought on a military consultant to help them get basic things accurate so they did not alienate the military audience. They created an awesome app with literally hundreds of videos you cannot see anywhere else. 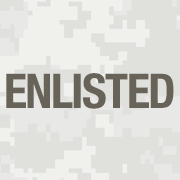 But ENLISTED faced an uphill battle. It was given the Friday death slot where shows go to die. ENLISTED also faced more hurdles. They showed some shows out of order. In the episode “Homecoming”, Derrick had the girl and a few weeks later he was trying to get the girl. Then the Olympics happened and the show was not shown for several a few weeks. How you are supposed to build a fan base without a consistent show I will never know. Fox found this out after the first season of “24.” There were too many interruptions of the show which is why the following year they went to a January premiere date. Maureen Ryan (@moryan) did a story in the Huffington Post about why the show should be saved. She invited people to send her ideas. Bart Smith offered up a wonderful suggestion: Why don’t we donate to the Wounded Warriors Project in honor of ENLISTED? So Maureen did. She put in honor of ENLISTED and her father who served in the military, and sent the receipt to Fox. I did as well. My father-in-law served in the Navy in World War 2 and my father served in the Navy during the Korean War. I have many cousins who served in the Army and Air Force. I decided to make a donation as well. 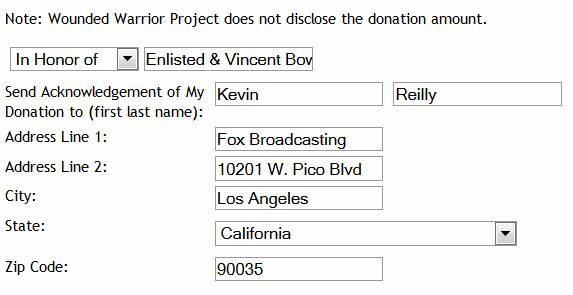 Here is the link to The Wounded Warriors Project and the screen shot of how I filled out the “in honor of” just like Maureen did. (Their contact us form isn’t really clear which one to use). (Their contact us form is not really the place to send thanks). Now get to work troops! Thanks for all the work you are putting into this show. It is the best comedy I have seen in many years and I love how supportive it is to our military. Im sorry, I just don’t think it’s funny. FOX has much better stuff in the hopper. Your opinion. They do have great stuff coming up but they could do with one less unscripted/”reality” show and more things like this.